Located in uptown New Orleans, a short walk, drive or Uber ride anywhere! Relax and enjoy the ambiance in this classic New Orleans home with hardwood floors, beautiful art deco features, and modern decor. Spread out in the large bedrooms, and warm living and dining areas or venture out into the city and enjoy all that New Orleans has to offer. 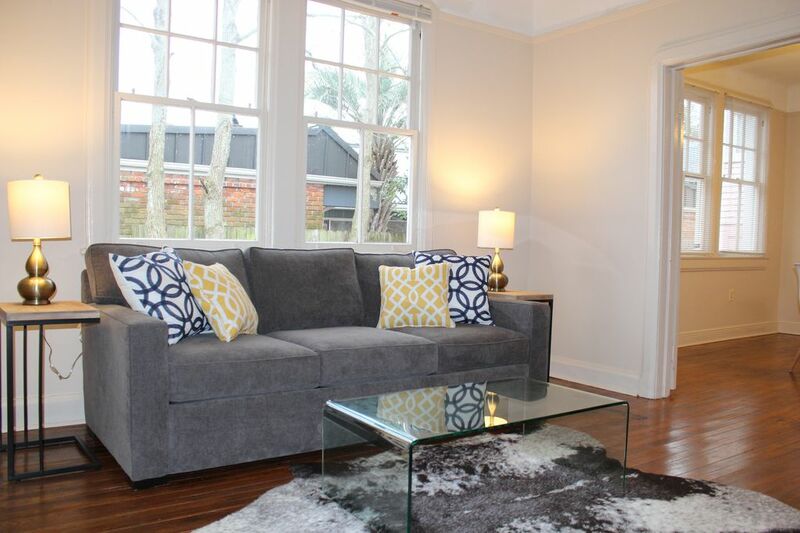 Centrally located in Uptown New Orleans just minutes from Tulane/Loyola, Freret St. Neighborhood, St. Charles Avenue, the French Quarter, and CBD. Located within walking distance to the Uptown Mardi Gras parades as well! We are in a quiet, safe, and walk-able community! Whether you want to walk around the neighborhood, stroll along the Broadmoor Fine Arts & Wellness Trail, or visit Freret St! We look forward to making your trip memorable! Short or Long Term, we want to make your stay feel like home! Message us if you have any questions! Check out this car on Turo! Our property is centrally located in a safe, quiet neighborhood nearby everything New Orleans has to offer. The house is a side by side double and we live in the other side so any and all requests you might have are easily accommodated. We are a 5 minute walk to Freret St., short uber/car ride to the CBD/French Quarter or Tulane/Loyola. Come enjoy a New Orleans style home that feels like your own! Our property has a full service kitchen, stackable washer/dryer, shower/bath, dining and living room space, and two new beds in the master and secondary bedrooms! In addition, there is a queen sleeper/sofa and a twin daybed with a twin trundle bed for additional guests. Enjoy outdoor living with our beautiful and spacious front porch equipped with a porch swing, charming flower boxes, and a a cafe table and chairs where you can enjoy your morning coffee, cocktails, or even dinner. We have Hulu live TV, Netflix, and hi-speed internet. There is ample on street parking available on our corner lot. Experience this quaint New Orleans home with all the old classic charm that new Orleans has to offer. Classic deco era bathroom with vintage tile floor tile tub/shower, and plenty of amenities! Freshly changed linens on all the beds as well as linens for the sleeper sofa. Washer/Dryer complete with laundry detergent pods and dryer sheets. Off street parking is available as well as ample on street parking. Large, super comfy towels provided. Large smart TV in the living room. Keurig coffee maker with coffee selection, sweetener, sugar, and creamer. Salt, pepper, sugar, sweetener, creamer, paper towels, sponge, dish soap, dishwashing pods, all purpose cleaner, and trash bags. Fully equipped kitchen with gas range, refrigerator/freezer, dishwasher, and over the range microwave. We also provide a Keurig coffee maker with coffee selection, creamer, and sweetener/sugar. The dedicated dining room has seating for six people. Large smart TV in the living room as well as smaller smart TV's in each of the bedrooms. Live TV streaming is available as well as Netflix. Spacious front porch with a porch swing and a cafe table with chairs. Gracious and helpful hosts . Cozy and comfortable house. Complete privacy and nice neighborhood within minutes of downtown. Would go back again and highly recommend it. Really enjoyed our stay at this home. Was in a quiet, safe, and cool area. Also easy to get downtown and the French quarter. The home perfectly fit our family of 5, and was vey comfortable and spacious enough. Had all the necessary amenities as well, such as a Keurig and coffee supply. Would definitely stay here again. Nice stay in New Orleans! This house was very nice to stay in, even though we weren't around much. At first as we drove into the neighborhood, I wasn't so sure. But after walking around and being greeted by neighbors out walking their dogs, I felt much more comfortable. This area is definitely an up and coming area. Uber drive to the French Quarter is less than $10 so we were close enough to the things we wanted to do, yet in a much quieter place. I would definitely return if I came back to New Orleans. Sorry we left beer and water in the refrigerator but I really didn't want to waste it since they were unopened!! Very nice stay, great owners and property! Entire stay was fantastic! Comfortable furniture and great accommodations to my needs. Jesse and Dan were easy to work with and talk to, we would definitely stay in any of their properties during our next New Orleans trip!